On paper if you project it out the Eagles will face their toughest test on Sunday.. any potential matchups after that would probably see them still underdogs but not to the extend they are Sunday. Even against Dallas in Dallas they would probably only be a 5 or 6 point underdog. I have no idea how they would win Sunday but I have a feeling they will. Might be one of those games were Special teams comes up big with a Sproles Punt return for a TD, a blocked punt for a TD and a Defensive turnover for a TD. Anyway we can wipe that smug look off of Peyton's face will be welcome as he is my most loathed coach after you know who. I'm not so confident in an Eagles win, though Peters certainly is based on press that went out this week. I'll just wait and see but be braced for the worst. At another forum, I picked the Eagles to win this week. I might just be falling for the storyline, but the Eagles are playing well, and the Saints have had some real issues at times as their level of completion has stepped up. Last week I was 2 for 4, so my takes have about a 50/50 chance of being right, although I really wanted to pick the chargers, but I could not convince myself to pick 4 road teams, and decided the Ravens were the home team to bet on. 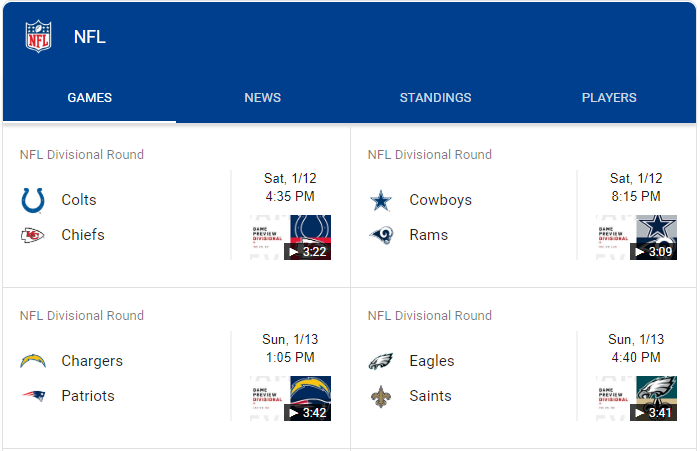 This week I have Rams in the other NFC games, and the Chiefs and Patriots in the AFC. I might take back the Rams, as the Cowboys sure did a number on the Saints, and I could see them doing the same to Goff and the Rams. But I don't think the Cowboys are consistent enough to bet on. I think this is the exact kind of game Belicheck wins with Brady. Rivers can manipulated and lured into INTs, and I think the Patriots get the the job done, even if it doesn't seem like it makes sense. I think Brady and Belicheck will capitalize on turnovers and outlast the Chargers. And the Chiefs are going to win 42-30. Everyone will notice how bad the defense is, and then pick them to lose to the Patriots the next week, ignoring how often the offense actually outcomes their opponents. The key is scoring early. When the Chiefs score in the first quarter it begins a process of panicking the other team into trying to score quick and often. That leads to points, but also turnovers and sacks that end drives. I think that the Chiefs are going to torch the ever-loving snot out of the Colts defense. It's starting to feel like a Chiefs/Eagles Super Bowl, which would be really fun, at least for Eagles and Chiefs fans. I think all of the games could end up being great games. The week link is probably Cowboys and Rams. In October, Kliff Kingsbury said he would draft Kyler Murray #1 overall in the NFL draft. Murray has declared for the NFL draft. Kingsbury is now coach of the Arizona Cardinals. The Cardinals have the #1 pick of the draft. People have put these tidbits together and suggested that the Cardinals could trade Josh Rosen and take Murray #1. If I'm the Jags, I come to the table with the #7 overall pick to offer. Arizona could draft Murray and then use #7 on the offensive tackle they so desperately need. The Jags would have their new young starting QB with basically zero cap hit, especially since his signing bonus stays on Arizona's cap. That would allow the Jags to more easily eat the stupid stupid Bortles contract while still having room to improve the team elsewhere. The Niners then run Nick Bosa's name to the podium at pick #2. This is usually the part where I wake up. Looks like KC is bracing for a snowstorm Friday Night through Saturday afternoon. They expect it to taper off during the game on Saturday. Accumulations right now are expected to be just 5 inches or so. St. Louis, on my side of the state is looking at 10 inches. So it could be an interesting development for the game. Who does the snow hurt more? Does playing in a dome, even in a midwestern state, hurt a team's play in bad weather? Mahomes played in cold, wet weather a few times and has produced just fine. Now it feels like playoff football! Browns are interviewing Jim Bob Cooter for the OC job, and Vance Joseph for the DC job. The Lions are interviewing both Steve Sarkisian and Nathaniel Hackett for the OC job, so I might as well flush Marvin Jones and any other Lions players on my dynasty team right now. The Jags are expected to interview... Darrell Bevell? I don't think I could handle Darrell Bevell being the Jags OC. Might as well bring back Gus Bradley for 5 more years while they're at it. It always seemed to affect Peyton. That's more like it, Brownies. Go ahead and throw on every down instead of feeding Chubb the rock. The only thing Cooter is good for is fantasy football. Vance Joseph's name isn't wacky enough to be on a staff with Freddie Kitchens and Jim Bob Cooter. Panthers news: Thomas Davis won't be back with Carolina next season. He says he wants to play one more year somewhere. We'll see. I might not make it to Eagles-Aints if KC-Indy plays in five inches of snow. Playoff snow is the best snow. Kansas City is painting the town Red and Gold. I actually just drove through town tonight on my way to Lawrence. Unfortunately, I am heading back to St. Louis first thing tomorrow morning to miss the incoming snowstorm on the road. Had to drop stuff off for the kiddo at KU that she was going to get this weekend until the forecast. It’s fun seeing the town all done up. Wish I was going to the game. I don’t blame you. On paper there’s no logical reason the Eagles will win or can win. Defensively the Eagles have had 35 starters. The secondary is basically all scrap heap guys that nobody has ever heard off. Our best running back is 35 years old coming off two season ending injuries and a bad hamstring that kept him out almost this entire year. The other running backs are basically nobodies. The offensive line for the most part this year has been brutal giving up sacks left and right and our mid season big trade at WR has been invisible. And Jason Peters, who was instrumental last week. So much for missing the storm. I’m stuck out on I-70. There seems to have been an accident up ahead. I’ve seen a dozen cars off in a ditch. An 18 wheeler that tailgated me went off in a ditch after finally passing me. Yikes.. be safe... or find a motel/hotel and hunker down for the night. Yeah, definitely. Not worth it! Hue Jackson has been let go by Cincy. It's sounding like Zac Taylor is the favorite to get the head coach job. You know, a few years of position coach NFL experience means you're totally ready to be an NFL head coach as long as it was boy wonder Sean McVay that you last coached under. I'm gonna mosey on down to Los Angeles and become Sean McVay's favorite Lyft driver or something. If I play my cards right, I can leverage that into a general manager job in 3 years, tops. Sean McVay's success is like the MCU exploding with the first Avengers movie and now everyone's trying to play copycat. At best you'll probably get the DC movies; at worst, the DOA Universal monster movie cinematic universe. And then there's out there stuff like the Mattel CU. I'm feeling better about the Cowboys against the Rams than I was against the Seahawks, somehow. (Famous last words) But the thing about the boys this year, and every year, is that they generally play up to or down to their competition. The defense can hang with high powered offenses like NO, but I also think they snuck up on everyone for that game. That won't happen again. I'm most worried about the patchwork offensive line just not letting Dak get killed. And there's been a lot of talk here about filling up nearly half that stadium with Cowboys fans; we'll see if that plays out. Vic Fangio is having a hard time getting an OC. It was supposed to be Gary Kubiak, but that has now fallen apart over disagreements on scheme and staffing. 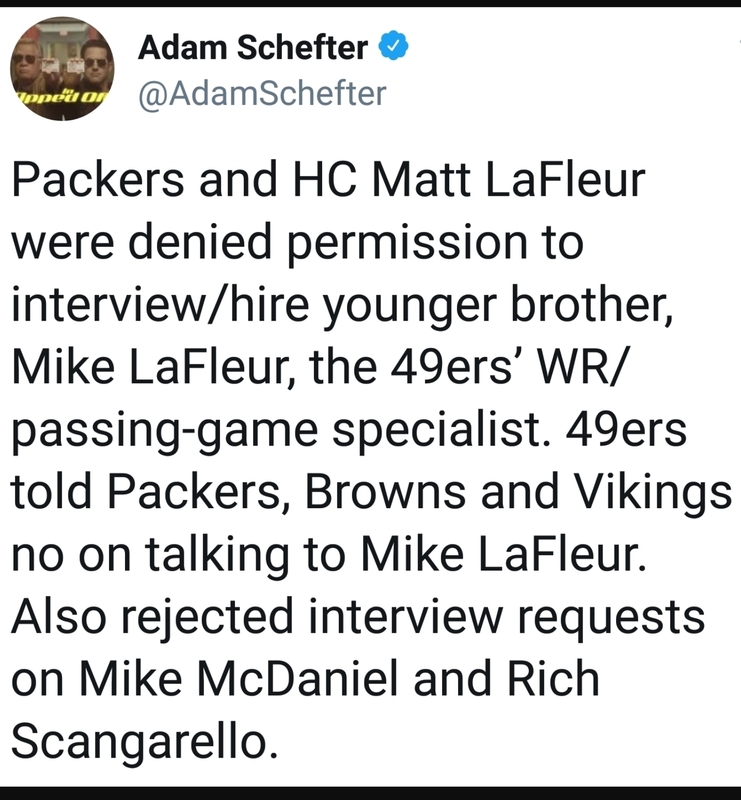 They also wanted to interview 49ers QB coach Rich Scangarello, but the Niners denied the interview request. Sounds like Elway continues to be bad at his job. Also, Browns hire Steve Wilks, which is a good move. The Arizona connection is real! I do love how his statement says he declined to renew his contract with the Vikings. Sure, guy, sure. First thought: damn, can't even bring in his brother? Cold. Second thought: as put by another commenter on Reddit: "For a team with the 2nd overall pick we're the only team on the bottom that other teams are trying to poach. That’s pretty telling of what we have here." I can't feel my toes just watching this on TV. Kubiak still wants to be an OC somewhere, and the Jags are interested. Yes please, save us from a Darrell Bevell offense. Jayhawker. Stop throwing snowballs. Be smart. Jayhawker. Stop setting off fireworks before the extra point is kicked. Be smart.